I have probably typed out the sentence “radical is embodying the gospel in everyday, mundane life” a thousand times on my obscure little blog. The reason I try to emphasize the importance of embodying the gospel in everyday life is because I believe we have the tendency to get bored with our average ho-hum existence and begin to wonder what is wrong with us. What if instead of always dreaming about a more dramatic, radical life we joined God in what he is doing in our quiet neighborhood, church, school and workplace? To spin it another way, what if the discontentment we are currently experiencing is a ruse to keep us from living out our faith right where God has strategically placed us? 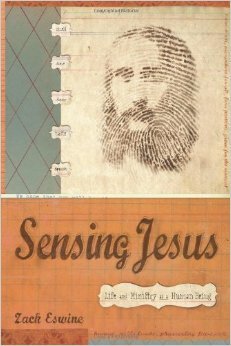 I first heard about “Sensing Jesus: Life and Ministry as a Human Being” by Zach Eswine from Lore Ferguson on twitter. The book is incredibly well written and I love it because it encourages us to see routine, everyday life as sacred and to seize the gospel opportunities all around us. Here is a lengthy excerpt from the book that I pray encourages you to embrace your life, right where you are at, as an opportunity to love God, love your neighbor and join in God’s ongoing redemptive work in the less glamorous arena of everyday life. A placeless ambition can likewise rob us of the kind of happiness that God intends. J.W. Alexander noted this in his Thoughts on Preaching. Happiness with the people and place we are in confounds many of us. But what if this is what Paul meant when he said that he loved people, that they were his joy and his crown (Phil. 4:1; Thess. 2:19)? With this thought, a sinking feeling infuriates the pounding within my chest. To dignify the ordinary with glory will require a radical shift in my habitual approach to life. In Chesterton’s words, like other pastors, I will have to relearn how to exult in monotony.